You can’t care too much about your lawn if you use a chicken tractor on it. Even with our portable dust bath box – which they seem to like quite a bit – you are going to get holes in your lawn. I’m currently going around once a week sprinkling seed and a bit of seed starter soil mix on those holes. Giving a quick rinse to the ground that you just moved the coop from gives a big head start to the droppings dissolving into the ground. Important when you still have two little kids wanting to run and play on that lawn. The hardware cloth skirt actually works to keep digging predators at bay. The PVC pipe on the outer edge allows it to float with the tractor when moving it, rather than getting bogged down. This would definitely *not* work with normal chicken wire (too flexible). In this hot, hot summer I’m having to water this portion of our lawn to keep it alive so the chickens can eat on it. Normally I’d let it go brown. Adding the cost of our water and electricity (water pump) to this project is not exciting. We’ve added a separate “chicken scraps” bowl to our kitchen counter that sits beside the “compost scraps” bowl. We’re diverting apple cores, bread crusts, etc to the chickens to supplement their feed. We just planted comfrey, which performs several minor miracles, even though most folks think of it as a weed. We’re using it specifically to accelerate our compost piles and as a chicken feed. Hey, grow your own free chicken feed! Hat tip to the Deliberate Agrarian for the comfrey knowledge transfer. Tying a rock to the edge of the tractor allows the chickens to peck on something hard, wearing down their always-growing beaks. Weld two sets of small metal tubes together for the trapdoor joints; the PVC ones already broke. Still OK, though, since zip ties hold the hinge in place. Two trap doors instead of one. When we place everything inside (2 nest buckets, 1 waterer, 1 feeder, 1 dust bath box), that one quadrant gets a bit hectic. 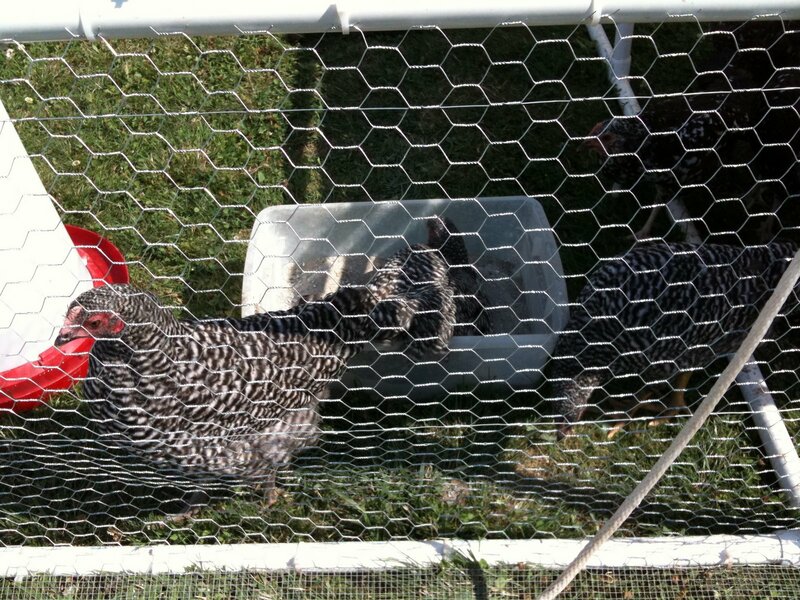 Although it does allow the other three quadrants more open space for the chickens to scoot around in. Add a temporary divide wall to section off a portion of the coop when introducing (or reintegrating) new birds into the flock. I’ve currently got one of our Dominiques off by herself recovering from almost getting pecked to death by the others. I’m thinking of segmenting off a couple of feet down one side of the tractor just for her when reintegrating her.